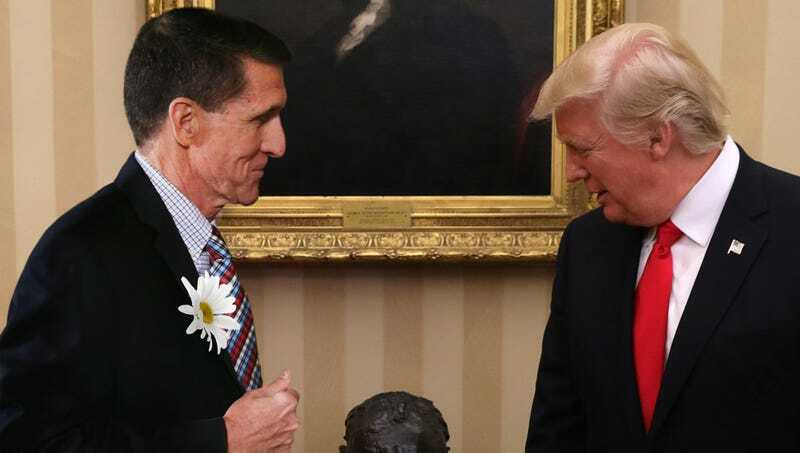 WASHINGTON—Strolling into the Oval Office and standing in close proximity to the president, former National Security Advisor Michael Flynn reportedly asked, “So, what did I miss?” Monday while meticulously tilting the large flower on his lapel towards Donald Trump. “Sorry I missed you these last nine months, but now I’m totally available to lend an ear if you want to vent about anything, or just feel like reminiscing about the 2016 presidential campaign,” said Flynn, leaning over the Resolute Desk and urging Trump to speak clearly as well as apologizing for being “a little slow on the uptake” when requesting that the president repeat several remarks. “Just for clarity’s sake, when you say ‘Jeff,’ you’re referring to Attorney General Jeff Sessions, is that correct? Go ahead and give me as many specific details as possible about the nature of those conversations, and while you’re answering, why don’t you take a sniff from this beautiful daisy?” At press time, Flynn was abruptly heading towards the door and whistling loudly as the sound of feedback began emanating from beneath his suit jacket.